We will be announcing further happenings throughout the year so please keep checking back. Monty Python, Thelma & Louise, Dire Straits, George Harrison, Nellie the Elephant, Little Mix and Chris Ramsey… they all have links to South Tyneside. Come along on our South Tyneside Coastal Heroes music, film and TV tour and hear the stories, the connections, the coincidences and the gossip, in a three-hour trip on our classic double-decker bus with two refreshment stops at iconic locations, and all linked together with musical gems and a running commentary from Mr Ray Laidlaw (he’s from Tynemouth but has a ferry pass). Our pickup times are 3.00pm from the Gibraltar Rock pub in Tynemouth then 3.30pm from the Customs House, South Shields. Join us for a Bank Holiday Special — our famous MUSIC & FILM HERITAGE TOUR departing Bewick Street, Newcastle (opposite Central Station) at 3.00pm and returning roughly three hours later — we’re usually a bit late returning because we always have so much fun! Our 3-hour tour of on-board chat and music, hosted by the legendary Mr Ray Laidlaw, includes a backstage tour of a music venue and two stop-offs at very popular watering holes, promising as always to be a fun-packed evening out. We will be visiting a BRAND NEW venue on this tour! "Them Off The Viz" Tour — The Final One! IT TOOK SOME SOFT-SOAPING DID IT NOT but after years of gentle threats then almost begging, “Please come aboard our bus and tickle our pants off with your tales of growing up, how Viz began, and a bit of stand-up too. And fetch a guitar n all." So won over was Simon Donald to the Tyne Idols cause, this time he’s bringing his brother Chris Donald too. So, we invite you on this very special, one-off tour. Well actually, this is now the umpteenth “one-off”, and possibly the severalth “final one” but you know the drill. Join us for our famous MUSIC & FILM HERITAGE TOUR departing Bewick Street, Newcastle (opposite Central Station) at 7.00pm and returning roughly three hours later — we’re usually a bit late returning because we always have so much fun! Our 3-hour tour of on-board chat and music, hosted by the legendary Mr Ray Laidlaw, includes a backstage tour of an iconic music venue and two stop-offs at very popular watering holes, promising as always to be a fun-packed evening out. We will be visiting a BRAND NEW venue on this tour! This Tyne Idols full package starts off at 12.30pm on Sunday, 26 May 2019 with an insightful tour hosted by one of Keith Crombie's very best pals who also featured in the film The Geordie Jazzman, Mr Bertie Forster. Bertie has enlisted other lifelong friends of Keith to share the history and anecdotes of the legendary owner of The Jazz Café over the years. Prepare to laugh, gasp and reminisce in style on our vintage double decker bus with the added bonus of the best bus-based sound system available. The tour will wind its way to The Exchange in North Shields where a Pie ‘n’ Peas Supper awaits at 4.00pm to keep you going until our screening of The Geordie Jazzman commences at 5.30pm. This will be followed by a Q&A with Abi Lewis, director and producer, and featuring guests from the movie. After the Q&A we will be rounding the day off with Jazz at The Exchange Bar and a chance to catch up with all the folk who made The Jazz Café their spiritual home when Keith was in residence. Needless to say, we positively encourage you to bring nibbles and drinks for sustenance on the bus tour (plastic cups and glasses only please) and of course the bar at The Exchange will be fully functional at all times during our occupation of the premises. Our bus is available for Private Tours and Events, which have proved very popular since we began, and have included corporate, birthdays, weddings, trips to concerts, and party stop-offs around various drinking establishments (okay, pub crawls). Something a bit different than a stretch limo, and you can fit five times as many folks onto our bus. You are permitted to bring along your own drinks and nibbles to get you in the swing. Our pickup times are 6.30pm from the Gibraltar Rock pub in Tynemouth then 7pm from the Customs House, South Shields. 7.00pm from Bewick Street, Newcastle. Tickets £15pp. BASED ON HIS RECENT BOOK, media historian Chris Phipps takes us on his tour of Newcastle’s film and TV locations covering old favourites like Payroll and Auf Wiedersehen, Pet and shining light on some hidden gems such as The One and Only, Unconditional and The Clouded Yellow. Newcastle and the region continue to be the perfect film set, visit filming sites for Vera and Transformers: The Black Knight. Forget Carter! What could be next for this photogenic city? THIS JUST IN… We have seats reserved in the GOLD Section of the Tribune. Leaving Gibraltar Rock, Tynemouth at 5.30pm and Bewick Street (opposite Central Station) at 6.00pm arriving back in Tynemouth at approx 1.00am. THIS JUST IN… We have seats reserved in the SILVER Section of the Tribune. Leaving Gibraltar Rock Tynemouth at 3.30pm and Bewick Street opposite Central Station at 4.00pm arriving back in Tynemouth at approx 11.00pm. It’s creepy… it’s kooky… it’s altogether ooky! Expect the unexpected! The tour will be followed by a meal at Lock at 5pm, and then off to the Exchange for a 6.30pm magic show by Newcastle’s favourite magician! Well we’ve only just gone and SOLD OUT haven’t we! PLEASE NOTE: THIS TOUR HAS NOW SOLD OUT! TWO new venue visits to be included in this tour! Our 3-hour tour of on-board chat and music, hosted by the legendary Mr Ray Laidlaw, includes a backstage tour of an iconic music venue and two stop-offs at very popular watering holes, promising as always to be a fun-packed evening out. Simon Donald and we would like to invite you on this yet another very special, one-off tour. Well actually, this is now the fifth he has done for us, but you know the drill. Our bus leaves the Gibraltar Rock pub, Tynemouth at 3.30pm, then to Bewick Street, Newcastle for another pickup at 4.00pm, and on to Bishop Auckland for this extravaganza which kicks off at 7.30pm. We return to Newcastle and Tynemouth between 11.30pm on Saturday and 12.30am on Sunday. PLEASE NOTE: This tour has now SOLD OUT. Come along on this brand new Tyne Idols music, film and TV tour and hear the stories, the connections, the coincidences and the gossip, in a three-hour trip on our classic double-decker bus with two refreshment stops at iconic locations, and all linked together with musical gems and a running commentary from Mr Ray Laidlaw (he’s from Tynemouth but has a ferry pass). Our pickup times are 6.30pm from the Gibraltar Rock pub at Tynemouth then 7pm from the Customs House, South Shields. Join us for our famous MUSIC & FILM HERITAGE TOUR departing Bewick Street, Newcastle (opposite Central Station) at 6.00pm and returning roughly three hours later—we’re usually a bit late returning because we always have so much fun! Our new-for-the-Summer South Tyneside Coastal Heroes Tours celebrate local legends of TV, film and music. Hosted by the irresistible Mr Ray Laidlaw, the 3-hour tour will also include some very special guests, and there will be 2 refreshment breaks throughout to whet your whistle in some carefully selected and interesting establishments. Our pickup times are 1.30pm from the Gibraltar Rock pub at Tynemouth then 2pm from the Customs House, South Shields. Our bus leaves the Gibraltar Rock pub, Tynemouth at 5.30pm, then to Bewick Street, Newcastle for another pickup at 6.00pm, and on to Bishop Auckland for this extravaganza which kicks off at 9.30pm. We return to Newcastle and Tynemouth between 1.00-2.00am on Sunday. What it says on the tin... our Coastal Heroes Tour leaves from the Gibraltar Rock at the earlier time of 12.30pm, followed by a FREE gig at the Magnesia Bank, North Shields by the Tom Mitchell Band featuring Ray Laidlaw – free drop off at the pub after the tour. Newcastle's Favourite Magician will host another Magical Bus Tour of the City! Expect the Unexpected — Chris Cross will recite tales of Northern witchcraft, stories of Houdini's visit to the city, a private visit to a condemned cell in Newcastle castle keep and lots more on this fun-packed Tyne Idols Tour, with a box full of magic tricks along the way for good measure! Tickets £10pp — book early to avoid disappointment! Tyne Idols are once again very proud to present this hilarious local funny man, radio presenter and actor from TV comedy Hebburn and Sunday for Sammy. For all bookings and ticketty stuff please call Julie Clay on 0191 253 1618 or email julie@tyneidols.com — alternatively you can buy direct from The Exchange. IT TOOK SOME DOING MIND but after years of gentle threats then almost begging, “Please come aboard our throbsome bus to tickle us with tales of growing up, Viz creation, and the stand-up routine with the characters and stuff”, Simon Donald was finally won over to the Tyne Idols cause. "Oh and fetch a guitar wi yeh." So, we would like to invite you on this very special, one-off tour. Well actually, this is now the fourth he has done for us, but you know the drill. Join us for our famous MUSIC & FILM HERITAGE TOUR departing Bewick Street, Newcastle (opposite Central Station) at 7.00pm and returning roughly three hours later—we’re usually a bit late returning because we always have so much fun! Leaving Eastbourne House, The Links, Whitley Bay at 3pm — our Coastal Heroes Tour celebrates local legends of TV, film and music. Hosted by the quintessentially debonair Mr Ray Laidlaw, this three-hour tour on the Tyne Idols double decker bus will celebrate all local TV, Film & Music over the last four decades, with two stop-offs in two local iconic venues. Crab & Waltzer Restaurant for a Fish 'n' Chip Supper (Veggie option available). A collection of songs inspired by the people and events experienced in the iconic Spanish City. Sue Capper: vocals, keyboards, guitar, saxophone; Dennis Quinn: vocals, guitars; Dave Cutler: bass; Dave Gudgeon: drums. 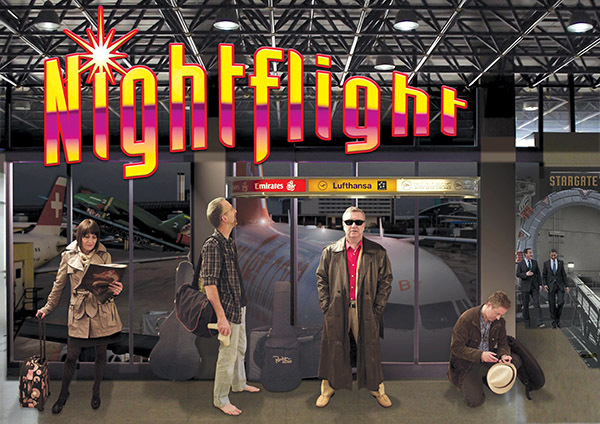 Nightflight will perform a selection of songs from their CD, these include memories of the early days of rock and roll, childhood, a scary song for a very scary ride, a cautionary tale about neglecting your girlfriend for a pinball machine, a homage to '60s sound and a few more songs from their large repertoire. Tickets £20pp including DVD. Contact wor Julie now on 0191 253 1618. Get your baggy trousers and Fred Perrys on! Though we won't be able to pull off an all-nighter and make the "three before eight" this time, we will be visiting two different clubs to shake out the talc for two one-hour spin and slide dance marathons! We will be leaving the Bewick Street, Newcastle at 7.30pm to return three hours later. Not surprisingly, this tour has now SOLD OUT folks! Have we got a Sting-tastic afternoon and evening lined up for you or what! Then it's off to Northern Stage for an evening of Sting’s very own musical 'The Last Ship'. 'In The Footsteps of Sting' Tour leaves from Bewick Street, Newcastle upon Tyne. As just one of many satisfied passengers from our previous Sting Tour put it... "The bus tour had my eyes watering as soon as 'Waters of Tyne' came on as we crossed the Tyne ... and my tears were never far away after that ... feelings so powerful." 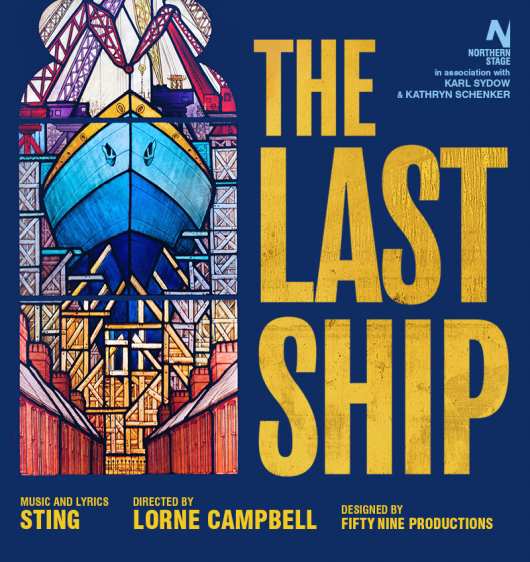 'The Last Ship' – Sting’s personal, political and passionate musical is an epic tale of community, hope and a great act of collective defiance. 'The Last Ship' features an original score with music and lyrics by Sting. Tickets for the show and tour inclusive are £45pp – we have great seats near the front of the stage!! This special tour has been timed to coincide with the Spillers Whalf performance of 'The Last Ship' which starts at 5pm. Please note: this tour does not include a ticket to that performance. Sting spent his formative years on Tyneside, his childhood in the ship building town of Wallsend and then his early days as a musician gigging around the city of Newcastle upon Tyne. Our Tyne Idols ‘In The Footsteps of Sting’ Tour will visit locations of special interest to Sting fans: the site of his Dad’s dairy business, the place where he bought his first real guitar. Pubs, clubs, concert halls, churches, shipyards and universities. Sites located between the city and the coast near to the river that played such a big part in his most recent and ambitious work, ‘The Last Ship’. There will be stops for refreshments and a surprise guest or two with an insight into Sting’s early musical experiments on Tyneside in the 1960s and ‘70s. As just one of many satisfied passengers from one of our previous Sting Tours put it... "The bus tour had my eyes watering as soon as 'Waters of Tyne' came on as we crossed the Tyne ... and my tears were never far away after that ... feelings so powerful." The 'In The Footsteps of Sting' Tour leaves from Bewick Street, Newcastle upon Tyne. Tickets for this fascinating insight into the local life and times of one of the world's most successful artists are £15pp.